A few weeks ago, I got an automated email. My domain registration for www.pieareround.com was about to renew itself. At that point, I was faced with a decision: should I let the registration expire or should I re-commit myself to this blogging project. After all, it had been quite a while since I last written anything for this blog. My heart just hadn’t been in writing for the blog lately; the joy had kind of gone out of it. Combined with the time it took to document and write each post, I seriously considered abandoning the whole thing. But a funny thing happened. Just as I was contemplating giving it all up, I had several people ask me, unprompted, what happened to the blog and whether I was working on anything new. Coincidental timing, but it at least inspired me to give it another go. I certainly have plenty of material I could write about. Over the past year of living together, Tania and I have cooked some amazing and delicious meals. It’s much more fun to spend a lot of time preparing a meal when you’re not the only one who will enjoy the fruits of your labor. Or the only one bearing the burden of cleaning up the mess you made. 🙂 It’s just so much more fun to cook with and for someone else. Most recently, I made Tania a variation on her favorite dessert. She really really loves banana pudding. Like, a lot. In the past, I’ve made her traditional banana pudding using this awesome recipe from Cooks Illustrated. To say it was well received would be an understatement. 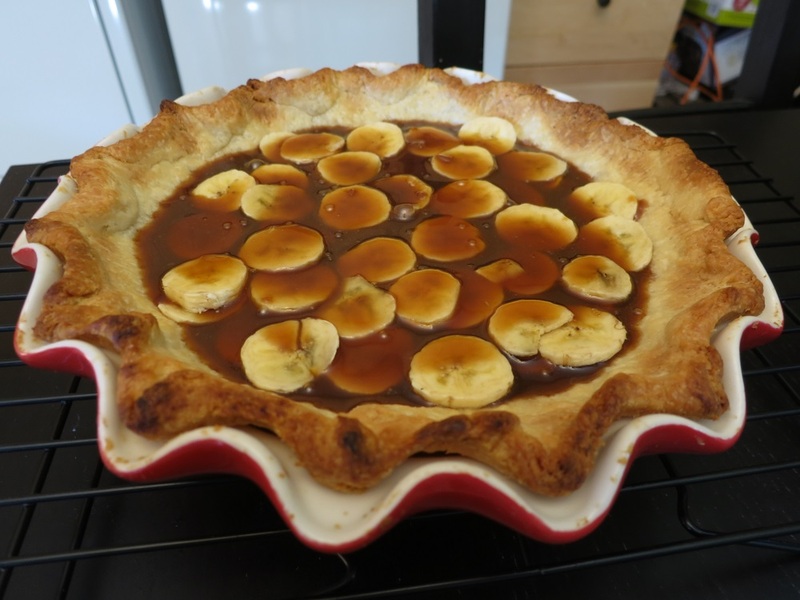 I like trying different things though, and so when I came across this recipe for Bananas Foster Pie from Serious Eats, I filed it away for future reference. This past week was apparently the future, because that’s when I made it. 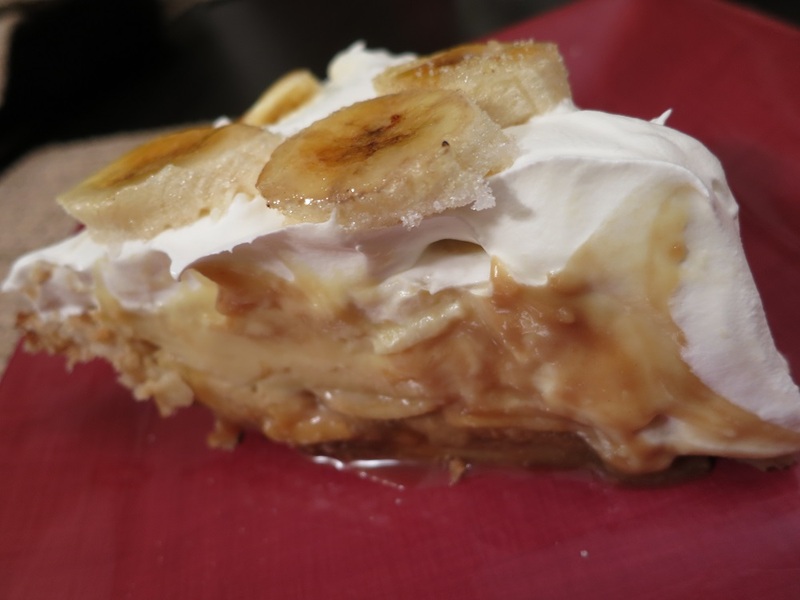 One of the key differences between Bananas Foster pie and regular banana cream pie is the caramel rum sauce that gets poured over the base layer of bananas. This was something that I thought for sure I was going to screw up, either burning it or not making it thick enough. I shouldn’t have been worried; it turned out great and really kicked the pie up a notch. Rum goes into the custard layer as well, which is also a nice addition. Bottom of the pie: bananas covered in the caramel rum sauce. Other things that the recipe provides that we didn’t do: a crust recipe. I’m partial to the Cooks Illustrated vodka pie crust recipe, so that’s what we used here. We also didn’t add the extra optional layer of caramel, but I could see that being delicious. The final touch that really put this pie over the top was the bruleed banana slices. The added crunchy texture took this pie from merely just good to phenomenal. That being said, this is definitely a special occasion recipe. It was incredibly time consuming. Here’s a list of the things that had to be made from scratch: pie crust, rum caramel sauce, custard, bruleed banana slices. And that’s even omitting the whipped cream. 2. Line the bottom of the baked crust with banana slices from 2-3 bananas. 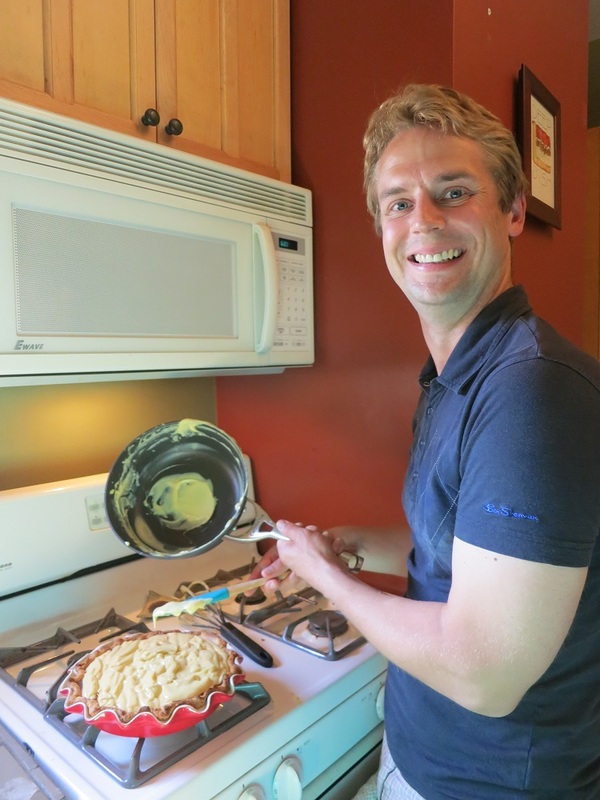 In a medium-sized skillet melt the butter and stir in the brown sugar over medium heat. Stir until the sugar is melted and begins to caramelize. Turn the heat off, stand back and add the rum (the mixture will steam and pop). Place over low heat and stir until the hardened chunks all become smooth. Stir in the cream and the pinch of salt. Whisk until the mixture is completely smooth and bubbles slightly. Pour over bananas, allow the mixture to cool. 3. Make the custard: Place the milk and rum in a medium-sized saucepan. Whisk together the eggs, egg yolks, brown sugar, cornstarch and salt until the mixture is lightened (about 2 minutes). Cook the milk mixture over medium heat until it begins to bubble on the sides. Temper the egg mixture with the hot mix mixture, adding the hot milk to the eggs a little at a time and whisking constantly. 4. Pour the custard mixture back into the saucepan and cook over low heat. Whisk continuously. The mixture will begin to thicken after 3-4 minutes. Keep at that whisking! When the custard begins to sputter or bubble, whisk really really really hard for two minutes. More whisking, this time the butter. Pour the hot custard over the bananas in the crust. Press plastic wrap directly on top and place in the fridge for at least 4 hours to chill. 5. Remove plastic wrap from the top of the pie. OPTIONAL caramel over the top of the custard and top with cold whipped cream (or Cool-Whip!). Sprinkle the granulated sugar over the bananas, coating them on a flat surface and then place the bananas on a metal tray. Brulee the tops of the bananas using a torch or under the broiler of the oven. Place them on top of the pie and serve immediately. This looks outstanding glad you got back into blogging!